This is a well kept hotel with lots of amenities. I liked that the business center allowed guests use of a printer and internet for free. Everyone was very cordial and rooms were very clean! The hotel was clean, updated, and located in one of my favorite parts of NOLA. However, the walls were VERY thin and the beds were quite hard. Great location - looks and feels nice and clean. Just didn't make for the most restful or comfortable stay. Very clean very quite area. Next to hospital. Felt safe. it wasclean and the staff very friendly. breakfast was also great! Completely satisfied! The room was clean and well appointed. The staff was friendly, helpful and professional. Great place to stay away from the noise and bustle of the French Quarter! Quick drive to downtown, free parking lot, modern hotel. Breakfast consisted of unhealthy options. Nice pool. Close to Tulane. Ok breakfast. Great staff. Hotel has a cute style. The room was not impeccable. You could see dust in the corners. The bed seemed like someone had laid on it right before we came in. We were so tired that we didn't say anything until the next day. When we informed the gentleman at the reception, he shortly said, "Oh. I'm sorry about that." Didn't seem to care all that much. Breakfast was average continental. If they pay more attention to the cleanliness of the hotel and rooms, and their customer service, it's a good place to stay at. Location is close to some bars and restaurants, but away from all the craziness, so that's a plus! The hotel was lovely, interior and exterior. Kind of tucked back away from anything. Staff was fantastic. Only complaint was couldn't get the AC to come down so room was consistently too hot. Close to restaurants and 15 minute walk to trolley. Loved the free parking and staff was very pleasant. Room for improvement on breakfast, but it is free so that's a plus. Clean and comfortable staff was very helpful in helping us get around. The hotel is lovely and very clean, the pool was great, rooms were great, the only thing is apparently the noise insulation is not the best. When we got there we took a nap around 5pm because we were depleted from travelling, we kept waking up because of vaccum cleaner noises and others. When the rest of the girls showed up that night we all got together in a room and were talking, this was the day before my bachelorette, keep in mind we also had a 4 year old girl and a pregnant lady with us. Some of them got in around 11pm, flying in from different countries, so we got together and started talking, with no warning call, an older male staff person came to knock on our door at 12:30 midnight, we of course did not open the door, there literally were only women in the room. 5 min later he called and said that we were making to much noise and that he had several complaints, that if it happened 1 more time they would kick us out. Really? All women with a child? We never got any warnings... is that the way to treat guests? We didn't have music or the tv on, we were literally just talking. Needless to say, I was very disappointed. The staff are very friendly here. The breakfast is basic, but serves it's purpose. The pool area is nicely kept. The rooms are small, and the bathroom is even smaller. It's so small that you can't help but touch the toilet coming out of the shower. The rooms looked clean, but my son found a leftover almond on the floor. The beds are a bit too soft in my opinion. 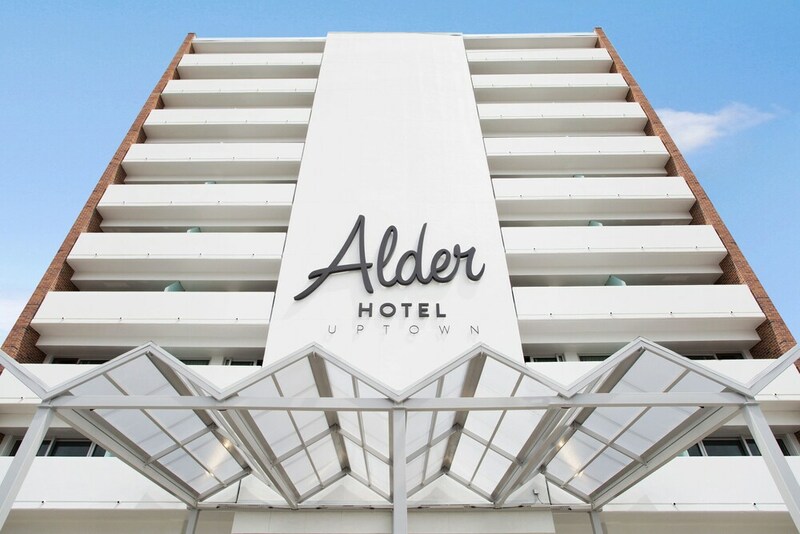 Located in Uptown Historic District, Alder Hotel Uptown New Orleans is within a mile (2 km) of popular sights such as Tulane University and Loyola University New Orleans. This 90-room, 3-star hotel welcomes guests with free breakfast, an outdoor pool, and free in-room WiFi. Free continental breakfast is served each morning from 6:00 AM to 10:00 AM. A flat-screen TV comes with cable channels, and guests can stay connected with free WiFi. The bathroom offers hair dryers and designer toiletries. Other standard amenities include a kitchenette, a balcony, and a refrigerator. Renovated in 2017, Alder Hotel Uptown New Orleans offers an outdoor pool, free WiFi in public areas, and a meeting room. You can put free parking to good use if you drive. Front-desk staff can answer questions 24/7, and assist with concierge services, securing valuables, and luggage storage. Additional amenities include a 24-hour business center, a computer station, and free newspapers. Thank you for choosing our hotel and taking the time to share your perfect rating! We hope to welcome you back to New Orleans—soon! Thank you for your feedback! We appreciate you taking the time to review our property as it allows us the opportunity to improve our services. Please know that your comments have been shared with management. We look forward to welcoming you back soon, and thank you again for choosing our historic hotel! Reviews like yours are what we strive for! Thank you for choosing our historic hotel and taking the time to share your experience. We're glad you enjoyed your stay in New Orleans and we look forward to the opportunity to welcome you back soon. Thank you for sharing the positive feedback for our hotel. We are thrilled you had a great stay and we look forward to seeing you again, soon. We are so glad you enjoyed your stay and LOVED your room! Thank you for choosing our hotel and taking the time to share your perfect rating! We hope to welcome you back to New Orleans—soon! We appreciate you taking the time to review our hotel after your visit! We are happy you enjoyed your time at our historic property. We thank you again for staying with us! We are so glad you enjoyed your stay! Thank you for choosing our hotel and taking the time to share your perfect 5-star rating! We hope to welcome you back to New Orleans—soon! Free continental breakfast is served daily from 6:00 AM to 10:00 AM. Recreation features at Alder Hotel Uptown New Orleans include an outdoor pool. The preferred airport is New Orleans, LA (MSY-Louis Armstrong New Orleans Intl. ): 24-min drive, 15.8 mi/25.5 km.